According to the letter, the reason for pulling out of Palmdale was due to a labor dispute with Antelope Valley Residents for Responsible Development, a labor-supported group that objected to the plant because of environmental reasons. Read the letter here. PALMDALE – Kinkisharyo International told the city it is forfeiting its decision to construct a 400,000-square-foot rail car manufacturing plant in Palmdale. Announced in June 2014, the proposed $60 million manufacturing and assembly facility, to be located at Avenue M near Sierra Highway, raised expectations toward creating hundreds of construction jobs, along with 150 to 200 permanent high-paying jobs once completed. According to the letter, the reason for pulling out of Palmdale was due to a labor dispute with Antelope Valley Residents for Responsible Development, a labor-supported group that objected to the plant because of environmental reasons. The residents’ group appealed an August decision by the Palmdale Planning Commission that recommended approval of the plant’s site plan without requiring an updated environmental report. The commission based its decision on reports that were completed in 1993 and 1996 for a planned office park on the site. However, Boss’s letter to Palmdale casts doubts on the group’s environmental concerns, claiming that AVRRD’s “CEQA-based ‘environmental’ objections were simply a pretext to gain leverage in their attempt to force us to agree to a card check agreement regarding the unionizing of our workforce.” Card check is a process that allows a workplace to unionize if 50 percent or more of the workers sign cards requesting representation for collective bargaining. Although the company has expressed disappointment over pulling its plans for a permanent manufacturing facility in Palmdale, the decision is not expected to affect its more immediate delivery of rail cars for the Los Angeles County Metropolitan Transportation Authority (Metro). 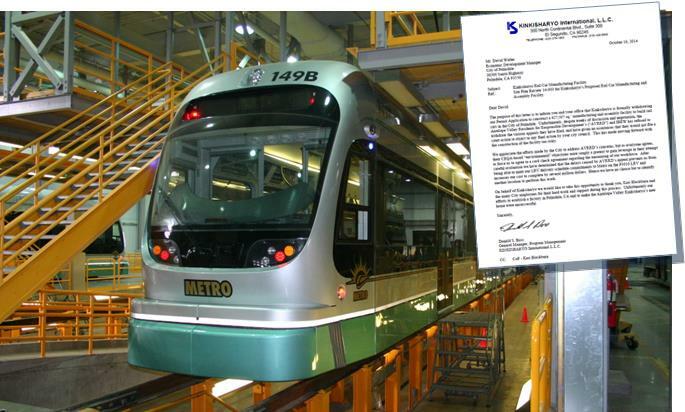 Kinkisharyo currently leases hangar space from Los Angeles World Airports in Palmdale, where it is assembling 78 light rail cars for Metro, according to Mark Madler who writes for the San Fernando Valley Business Journal. Madler said that AVRRD also opposed Kinkisharyo’s alternative proposal, which was to expand its current operations in the hangar space to meet its additional obligation to Metro to assemble 97 light rail cars. In his letter to the city, Boss said the delays caused by AVRRD’s opposition prevents Kinkisharyo from being able to meet its delivery schedule commitments to Metro, while also increasing its cost for completion by several million dollars.